It took a lot of careful and detailed measurement to prove that the speed of light doesn't change. But it also took one important thought experiment. The de Sitter Effect showed us how stars would look if light didn't have a speed limit. Light travels so fast that it takes extensive experimentation before anyone can understand that it actually travels, instead of appearing instantaneously. It takes yet more experimentation to find out about how fast it travels. After that, it generally takes yet more experimentation and debate to settle on the least believable part of light - the fact that it always travels at the same speed regardless of how fast the object making the light is moving. The absolute limit of 186,000 miles per second for light was considered absurd by many. It's still a strange concept. If someone throws a baseball to you at ten miles per hour, while standing on a moving sidewalk that is also moving at ten miles per hour towards you, you'd expect the ball to hit at twenty miles per hour, and you'd be right. Given how fast objects in space move, the speed limit of light would be like having someone sit on the wing of a jet coming at you at seven hundred miles per hour, and throwing you a baseball which hits you at twenty miles per hour because that's just how fast baseballs move. In the early 1900s, people were having exactly this debate. Those who argued for a constant speed of light, no matter how fast the objects that emitted or received the light moved with respect to each other, had evidence on their side. No one had managed to get a glimpse of light (in a vacuum at least) moving at any different speed. Others objected strenuously to this idea. There had to be some problem with the experiments measuring the speed, or some special quirk of light that no one had thought of yet. Otherwise it was simply too absurd. The behavior of light was different from every physical experiment done with every other physical object, but more than that, it seemed to contravene any kind of logic. Objects simply couldn't behave that way. Although the idea of special relativity came along during this time, the idea that time might give so that the speed of light wouldn't seemed to make this idea even more bizarre. People needed a way to think about the consequences of a constant speed of light that wasn't just rarefied experiments and abstract thought about time slowing down. Willem de Sitter finally gave star-gazers the kind of concrete and simple thought experiment they were looking for. 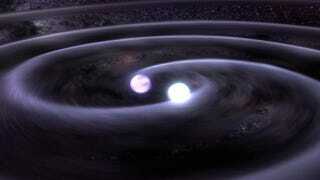 It involved a binary star system, in which two stars were orbiting around each other. One part of their orbit would have the stars moving directly towards the Earth, and one part would have them moving directly away from it. Picture only one of the stars from such a system in a universe with no limit on light speed. When its orbit is slinging it towards Earth, the speed of light coming from such a star would pick up massively. When it was orbiting away from the Earth, the light would slow down. To return to our "baseball from a moving sidewalk" example, it would be like throwing a ball at ten miles per hour from a sidewalk retreating at five miles per hour, then throwing it from one advancing at five miles per hour. One ball would be going at 15 miles per hour, and the next one at five. Although the one going slower would have a head start, the faster ball would soon catch up. When it had just caught up, the person on the receiving end would have to catch two balls at a time. Similarly, once the light from an advancing orbit star caught up to the light from a retreating star, astronomers would suddenly see two stars turn into three, or four. Depending on how fast the star was moving, light from an advancing star could catch up to light from a mid-point of orbit, while light from a retreating star could lag behind - forming three images of each star. Astronomers have studied many star systems, but no binary systems such as these, with "extra" stars winking in an out of existence at various points during an orbit, have been seen. Looked at this way, the constant speed of light is shown to produce some comfortingly prosaic results, instead of causing entire star systems to seemingly multiply and collapse spontaneously. This isn't to say that light's weirdness hasn't causes some star images to be doubled, but as de Sitter showed, there are some times when the constant speed of light can make it easier for astronomers, and layman, to trust their eyes. Via Alternative Physics and Hyperphysics.